Or did they? Let's find out. Per Times Magazine and many other news sites, Kentucky teens visiting Washington D.C. taunted a Native American veteran (Nathan Phillips) because of bigotry, racism, and hatred. Specifically, many of the students were wearing MAGA hats and jeered the Native American, chanting "Build that wall." One of the students even got up in the face of Nathan Phillips to intimidate, threaten, and make him feel unwelcome in this country. You can watch the video of the incident here (judge for yourself), and it looks terrible: a smug teen who thinks it's funny to smirk and instigate a confrontation based on bigotry. Later, Nathan Phillips gave a tear-jerking recollection of the incident, gaining sympathy from many: a Native American that, with quiet dignity, bravely stood up against bigotry and hatred. The Native American also claimed: "What the young man was doing was blocking my escape. I wanted to leave. I was thinking, 'How do I get myself out of this? I want to get away from it,'" Phillips said. Then Chris Evans, Captain America, called what the students did appalling, ignorant, shameful, and evidence that America is creeping back to its darker history. One of his fans even tweeted the 16 year old kid's name, encouraging: "Do your magic Twitter," so people would go after the minor. And all of this seems reasonable (except maybe that last part of encouraging millions of people to target/threaten a minor) when you focus on the context of just one video that recorded the incident. I agree it looks horrible. But then something strange happened... There are now videos surfacing that show the full incident, and from different angles. You can see that it all began with African American supremacists of the Hebrew Israelite movement spewing hate speech, including against the Native Americans. You can then see the high school kids starting to congregate around the 1:10 mark of the video, but they don't appear to be congregating to instigate a fight. In fact, as evident from 1:26:40, they're just waiting for their school buses to take them home and away—they’re congregating around the exact place where they should be. And they actually cheer when the buses arrive so they can leave a place they clearly don't want to be. At 1:12:10, you can see that it's actually the Native Americans, not the teenagers, who instigate the confrontation. But here's the real story. Remember the 16 year old kid who looked so hateful and bigoted, initiating a stare down with the Native American? The poster child of hate that all the media outlets are reporting? Well, it turns out that the media lied and ignored the full context of the incident. At 1:07 below, you can clearly see that the kid is just minding his own business (he’s not even one of the people jumping/chanting), just looking around and laughing with his colleagues. It’s the Native American who targets him for a confrontation/stare down at 1:14. The kid, instead of harassing and intimidating, was just standing in his own space, and looking back at an adult man who got up in his face. And remember when the Native American told the news that his escape was blocked, that he was just looking for a way out? Does this video look like an accurate recollection of that claim? Also, since when is anyone required to move themselves from their personal space? If a kid just stands his ground, makes no threatening gestures, just smiles—this is now what passes as bigotry and racism? That it's okay for his school to expel him? That it’s okay for Chris Evans’ followers to target a mere minor by spreading his name and encouraging Twitter to work its magic? I don’t see anything from Chris Evans, retracting or telling his followers to cool that hateful targeting. Such hypocrisy and hatred is all I see, from people supposedly non-hateful and tolerant. Oh, and remember how the Native American said the teens were chanting "Build that wall"? Turns out that didn't happen either. They were merely shouting their school chant to drown out the loud, hateful rhetoric from the African Americans of the Hebrew Israelite movement. Yahoo and Huffington Post doubling down with new evidence to validate their original stories. And once again, on the surface, it looks horrible. You have Covington high school students from 2011 absolutely caught in the act being racists. 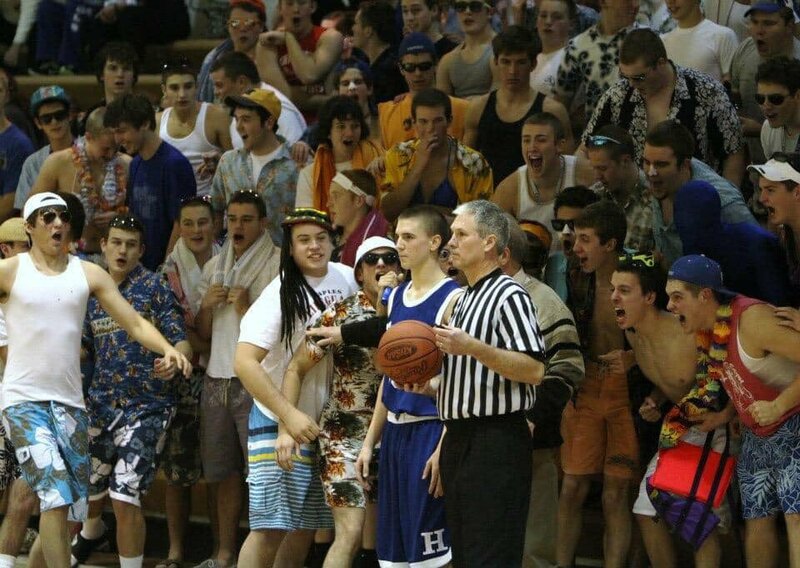 They're dressed in blackface and harassing a black basketball player. Look! They have a history of taunting and being jerks to white people, too. And as for the blackface? It was a "blackout" game, a color-themed game for school spirit!! People are encouraged to dress in black, and painting your body is what sports fans do everywhere! Just because the face paint happens to be black doesn't mean they were mocking African Americans. That's just stupid! Are liberals tired being misrepresentative and hateful, yet? The only thing these boys are guilty of is having raging hormones.